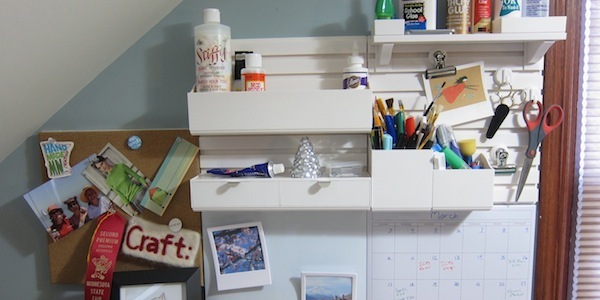 If you’ve followed this site for a while you know I have a problem keeping my craft room neat and organized, I even made fixing this one of my crafty resolutions for 2013. Ok, I’m going to embarrass myself now and give you all a peek into why this has become such an issue. My craft room is a little room under the eaves in our attic and the only work space I have is this long table. The problem is the table is covered with all the bits and bobs from past projects as well as glue, scissors and other supplies. It’s gotten to the point where I’m not doing as many projects as I’d like because finding the space and tools to do them has become a pain. When Avery and BlogHer offered me the opportunity to try out the Martha Stewart Home Office with Avery Wall Manager it was just the inspiration I needed to get my craft room together. I started off by cleaning everything off my work space. I threw away everything that was too small to use in another project or that I just didn’t need anymore. (You crafters know how hard it is to throw any scrap away because it might come in handy later, but I forced myself to be brutal.) Then I hung the Wall Manager above my cleaned off table. Because my craft room is under the eaves, the wall space is a little odd with slanted sides. 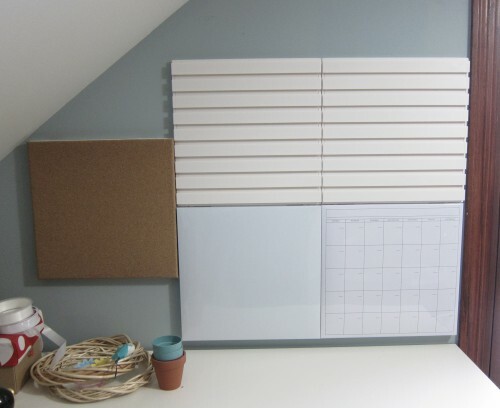 The nice thing about this Wall Manager organization system is it comes in 12″ x 12″ pieces which can be moved around to use the space to the best advantage. For my slanted wall, I was able to create a sort of stair step effect and use five elements (actually, I even have room for one more). With a large square single piece, like a bulletin board, I’ve been really restricted in size because of that slant. The pieces were very easy to hang thanks to their wall mounts. The wall mounts all have a built in bubble level to help get them straight. Wall safe adhesive on the back of the mounts holds them in place while you nail them in, no holding with one hand while trying to nail with the other. 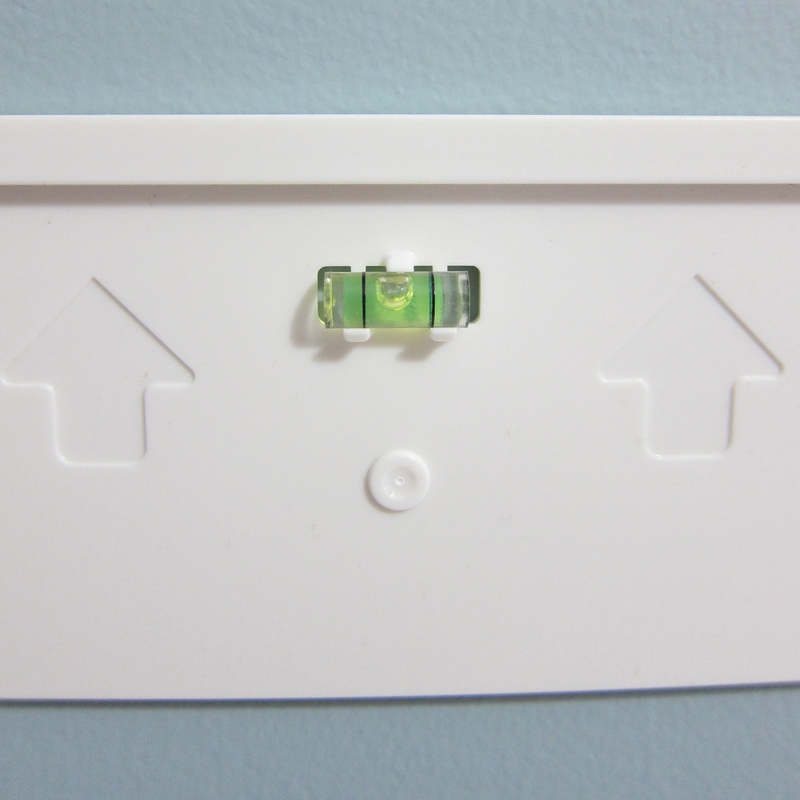 Guidelines at the corners help line up multiple wall mounts. The boards all use the same wall mount, so you can play with which piece goes where after the mounts are hung. This is important if you are like me and aren’t sure what you want where at first. Once the Wall Manager was hung, it was time for the fun of filling it up. I used a bulletin board, dry erase magnetic board, dry erase calendar and two accessory boards. 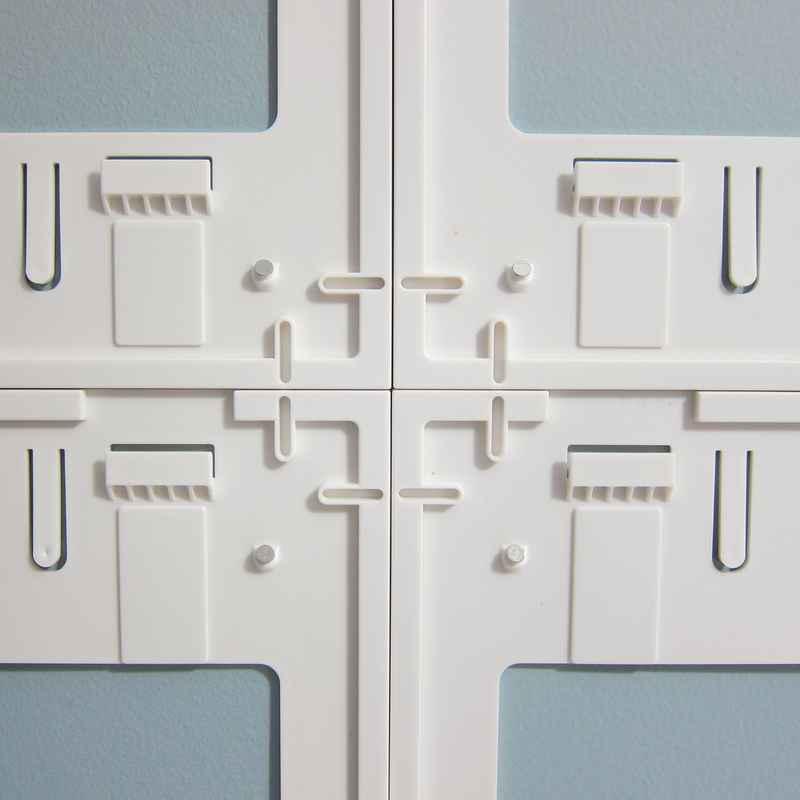 There are lots of pieces available to use on the accessory boards from drawers to clips to caddies to shelves. I love how stable they are and that they could support things like all my glue bottles easily. This is such a great way to get all this stuff off my work surface. I think I may need to get one or two more of the accessory boards. I can see getting a whole board full of drawers just to store beads… oh the ideas. And here is the final result of my big clean up. **5/1/13 The contest is now closed. The Martha Stewart Home Office with Avery Wall Manager is available exclusively at Staples and Staples.com, and we have a $100 Staples gift certificate to give away to help you get started getting your spaces organized. To be entered for a chance to win, tell us how and where would you use the Martha Stewart Home Office with Avery Wall Manager products? Rules: No duplicate comments. You may receive (2) total entries by selecting from the following entry methods: a) Leave a comment telling us how and where would you use the Martha Stewart Home Office with Avery Wall Manager products on this post b) Tweet (public message) about this promotion; including exactly the following unique term in your tweet message: “#SweepstakesEntry”; and leave the URL to that tweet in a comment on this post c) Blog about this promotion, including a disclosure that you are receiving a sweepstakes entry in exchange for writing the blog post, and leave the URL to that post in a comment on this post d) For those with no Twitter or blog, read the official rules to learn about an alternate form of entry. This giveaway is open to US Residents age 18 or older. Winners will be selected via random draw, and will be notified by e-mail. You have 72 hours to get back to me, otherwise a new winner will be selected. The Official Rules are available here. This sweepstakes runs from 4/1/13-4/30/13. Be sure to visit the Avery brand page on BlogHer.com where you can read other bloggers’ reviews and find more chances to win! ***Disclaimer: This is a sponsored post. I was provided with the Wall Manager, accessories, gift certificate to give away and payment for this post. I was not told what to write and all the views are my own. If you are not reading this post in a feed reader or at http://justcraftyenough.com then the site you are reading is illegally publishing copyrighted material. Contact us at justcraftyenough AT yahoo DOT COM. All patterns, text and photographs in this post are the original creations & property of the author unless otherwise noted. 6 years ago by Kat in Giveaways and Contests , Reviews , Tools | You can follow any responses to this entry through the RSS feed. You can leave a response, or trackback from your own site. I just got an office for my small business, where I do everything from bookkeeping to creating small crafty promotional products. I would use the organizer there! My goal this spring is to clean out our front porch (three season) and turn it into a craft and playroom. This sort of organizer would be perfect. 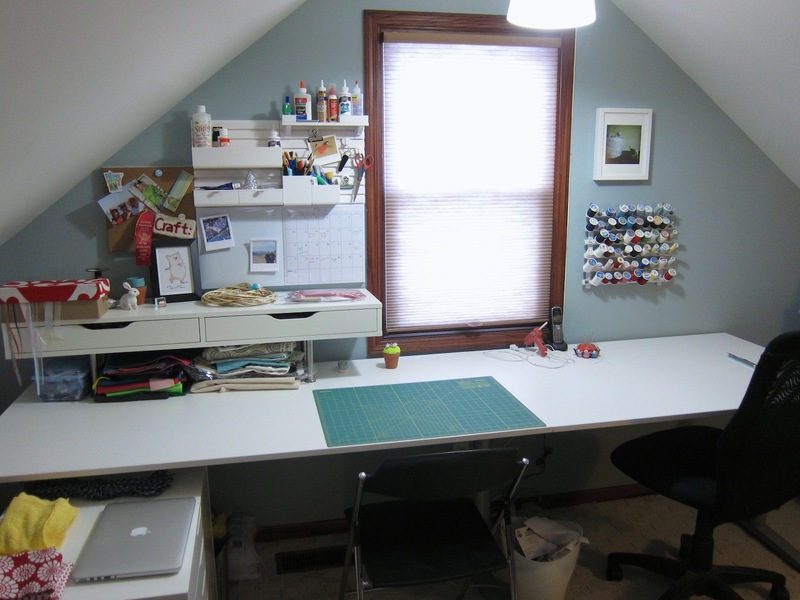 I love what you’ve done with it in your own craft room! Love your new organized space! Has to make you want to create! 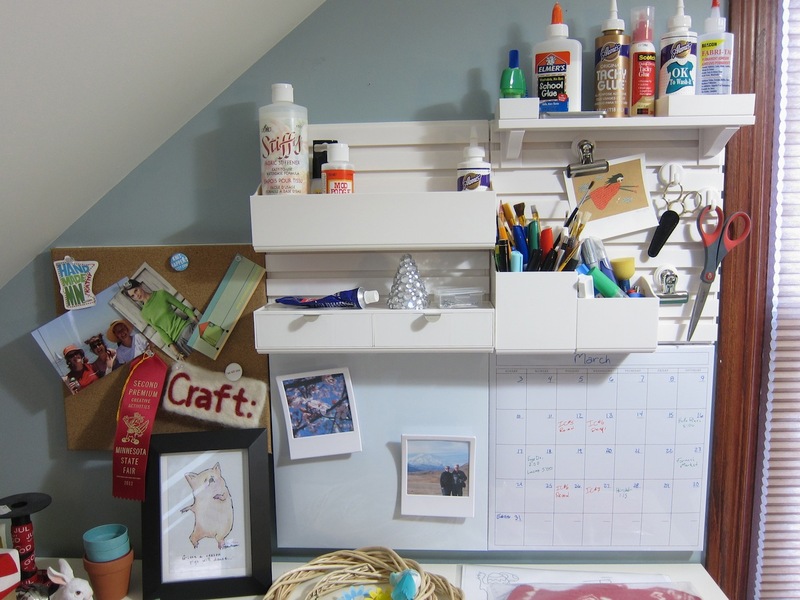 I’d use the Martha Stewart organizer on the wall above my cutting table in my sewing room. I wouldn’t use it right now, even though my craft room is in desperate need of some love. However, I’m going to be moving mid-year and it would be lovely to have it all nice and ship shape from the beginning. 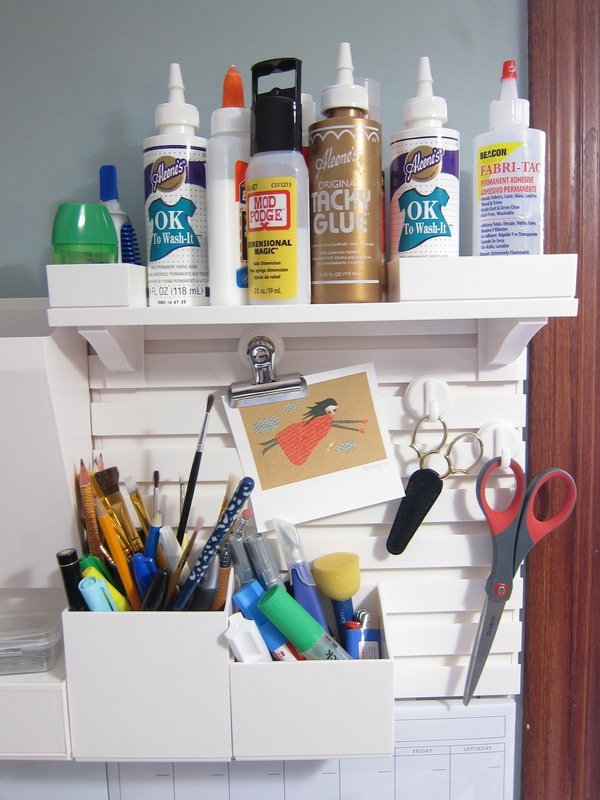 Oh my gosh, your craft area looks amazing! You must feel so refreshed in there now. I’d use this at my desk. I make my jewelry in the dining room because there’s not enough room at my desk. My desk is currently a mess. I have papers from the kid’s schools, my stuff, desk toys, etc. I need to organize! I would use it in my entryway to organize bills, mail, and important papers. I have the same kind of slanting wall just where my desk is, so seeing how you used this is great inspiration for me…..I would use it in exactly the same way as you, :)…..thanks for the chance to win! My art/craft room. Don’t really have a big room (part of basement) and would love to win this so I can organize it better. Need some organization especially I am going to start some art classes for some kids. Thanks for the chance! I would use the system in my kitchen area so all of our keys, phones, calendars, and papers will be organized and pretty! 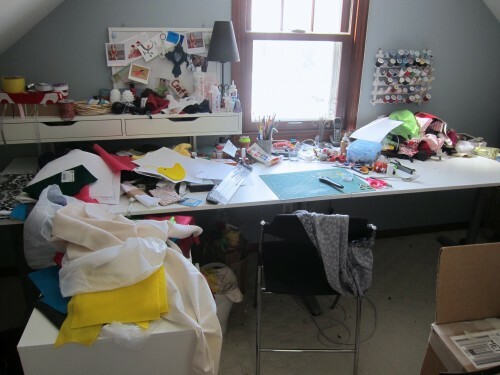 I would use the Martha Stewart Home Office with Avery Wall Manager in my spare room so I could get my yarn and fabric and patterns and all the rest of my stuff out of the tubs they live in. That would let me see what I have and group things together smarter. It would also free up a ton of floor space so I’d have room to open up my cutting table and sit comfortably. I was just trying to think how I could organize my kitchen desk in a neater way…this would do it! My craft space currently looks like your before picture. I am sure imitation is the sincerest form of flattery because I shall be doing the same as you, I just ordered the cutting mat last night before I read this, so I have made a start at least, the voucher would help me with the rest! I am inspired by your new space and delighted to find out that “Crafty” Martha has done it again…. only she and her “Crafty Elves” would think of a built in leveler and temp. holding tabs….. Off to my Staples this AM to find the organization tool that will finally allow me to see the top of my workspace. Also thank you for giving me permission to toss those annoying little pieces of “Potential, I May Need This Someday”…. I have drawers full of them taking up precious space and VERRRRRRY rarely find just the right one to use….!!!!! YIKES! Hope I win so I can by several…. I too have made cleaning my craft room a New Years Resolution . This new system would help me emensely! I LOVE this!! I would use it in my office/craft room. Thanks for the giveaway. I’d definitely use it in my studio. Oh, what a help it would be for those items I use all the time. I’d love to have them organized and within arm’s reach. We’re moving soon and I can envision this in my new office! I have a little cubbyhole in my bedroom that is my computer area and it always is such a mess because of being so small and not really having a place for everything. I would fix that spot up and make it neat and cute. This would be perfect for my home office. Thanks for the chance to win! This would be a great addition to the blank walls in my home office. With “stuff” ranging from work to school, it would be a great way to give those papers a home. I would use it in my den — I have so much loose paper, scissors, pens, pencils — you name it — lying around everywhere. This would help keep it all together. These would be great in our home office. Right now it is just a pull out bed (as it is also the guest room) and a desk with a computer and lamp. It would be great for some organization thought to go into the room. I would use this next to my computer to help me organize myself a bit. I’d also love to add photo’s to give it a homey touch. I would use this in our computer room, above our computer desk. We could organize our important bills, a couple of small gadgets and random items. It would be a great organizational tool for us to help clear up space on our desk. I’d love to organize the home office. I have so much clutter on my desk. I would use it in our home office to organize it. We’d put this right by the door in the kitchen so that every member of our family can check schedules, write messages and reminders, and leave important documents and papers. I would put it by my computer to keep my office supplies organized. I’d use it anytime we have time off from school for any project my daughter wants to work on. i’d use a gift card to buy a huge travel drive for use to back up my files easy peasy. It doesn’t look like my original comment went through. I need some organization in my laundry/sewing room. I would love this for my office! I’d have it in the kitchen and I’d purchase another one for the bedroom. I’d use the products to clean up my office area, particularly my cluttered desk! 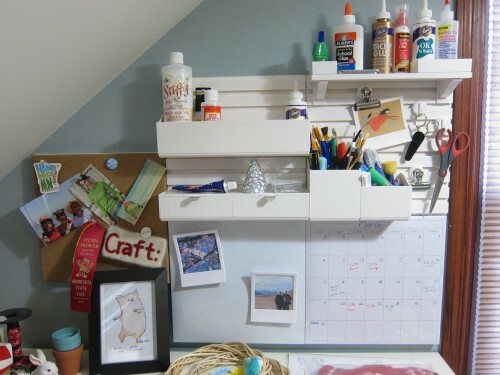 These products would be great to use in my home office to get me more organized. I would use it as a command center, and it would be in my kitchen! 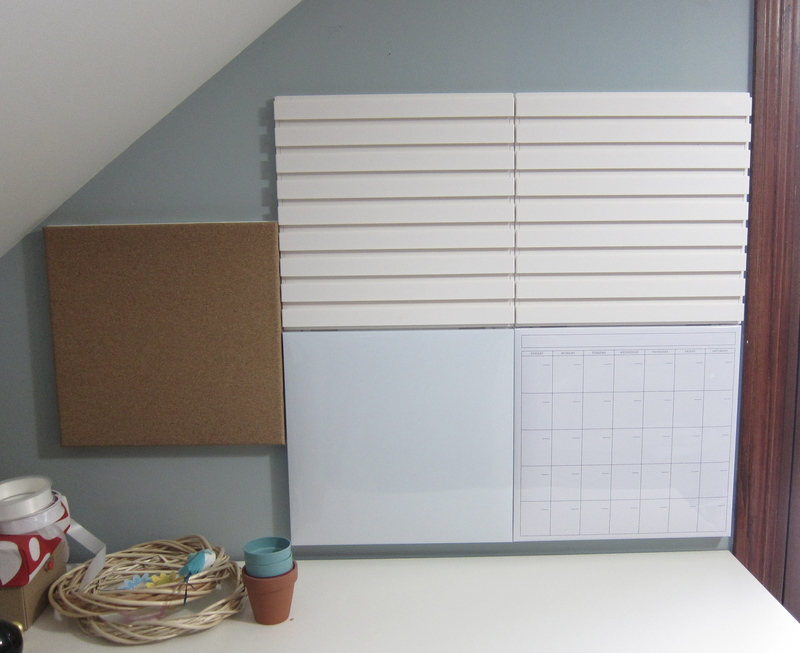 -I love the wall manager for our home office, it will help a lot to declutter the desk and coffee table. I’d love to have this in my home office. I work from home and there’s always so much clutter around my desk. I’d put it right above my computers, that would keep me organized so much better! I’d use this in my computer room to store notes, pens, paper, and other odds and ends. i would use this in our home office to take control of our clutter and all the papers that are scattered about. Wow this is awesome! I would use it in the kitchen to help organize the never ending pile of stuff that ends up on our kitchen table! I would use this in my Lady Cave to organize my stuff. Our computer area is always a mess. This would greatly help make the area more organized!! I’d use the organizer in my den to put weekly papers, shopping lists, ad circulars, coupons and notebooks I need to reference regularly. These Martha Stewart Home Office with Avery Wall Manager products are cool. I love how organized your space look after putting them on the wall. I will use them at my home office. I have some kids pictures and drawings I want to hang up and I need a place for my receipts and crafting tools. I would hand them in the corner of my dining room I laughlingly call my office. I would use them to sort bills and other important papers. I would put the wall manager in my kitchen/dining to use as a home command center and corral all the office supplies needed on a daily basis. I’d use this in my craft area! I would use this in my office above my desk, it would definitely be put to good use. My office is a mess! id put it up by the front door for keys and knick knacks! i would like to use it in my home office – it would be so nice to get everything neat and orderly so i can be more productive! i would use this by the front door to organize keys, mail, etc. My home office area is my kitchen table but Lord knows I need to organize all my information!!!! I desperately need to get all the important paperwork together & have a central place of the keys, etc. I would use them in my dining room which is also my craft/sewing room. It is kind of a mess right now so I’m sure they would be very helpful. I have 3 places to use it: The craft closet because currently we are limited by the shelves that are fixed so have no flexibility for different height supplies and these adjustable bins are fabulous. The kitchen because papers and do-dads currently clutter the counter and the junk drawer is full – this would revolutionize the storage for all those papers in transit with a calendar and place to take notes all in one place. Finally, my office – getting everything vertical to free up surfaces and keep them easily accessible. The clean lines and uniform color are really appealing too. yay! !we just renovated our office so I’d definitely use it in there to make the most of our shared space! I’d love to use these in my art room to declutter everything and give it a nice fresh feel! My home office could use some Martha Stewart help and ideas. This would be what I need to organize my papers and take the clutter off my desk. I would use this in my home office for that purpose. Love it, I could put it next to my computer for sure. 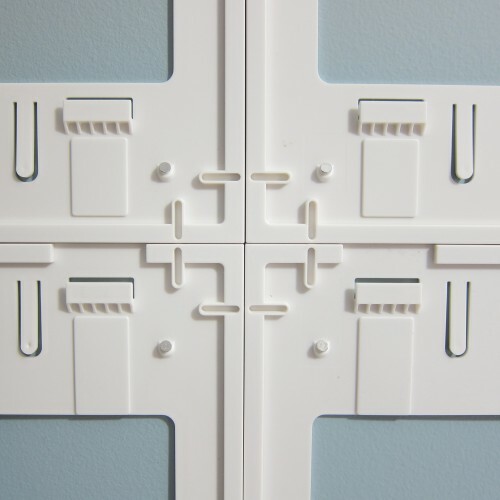 I would use this in the corner of my bedroom where I try to keep more files and other stuff organized. I’d love to use these products to help me organize my home office. I could use this for organizing my kids’ homework! What needs to be done, what’s already done and needs to be turned in, library books, and all the tools needed to get the work done! I would use it in my very cluttered kitchen, to try to organize it. I would use it in my classroom to help me get more organized. I would use these to get my office organized. There are too many loose papers that need a home. My home office needs a total re-do. I’m ready to ditch the mismatched big lots crap and replace it with Martha’s coordinated collection. Perfect for my home business!! I am moving into a new home next month and want my office/craft area to be neat and organized. I have so much stuff but no where to store it. I would love to use the Martha Stewart Home Office with Avery Wall Manager products right above my desk! My husband is the crafter in our family – and I will just say that he could definitely use this. we are short on space, especially my desk area, and this would be perfect for adding extra storage vertically! love this! I have a sewing room with TONS of notions and patterns that are in dire need of organizing! I would love to use the Martha Stewart Home Office products in my home office! I’d use it in my home office–I need some serious help keeping everything organized! I would use it in my home office, which is really just a corner of the family room. It would be great to help organize my work and the kids school work. I would use them for my office for work. I would actually donate this to my friend to use in her kitchen to help her organize her home bakery stuffs! I would use the Martha Stewart Home Office with Avery Wall Manager products to get my home office organized. I have a tendency to be messy and that leads to a lot of time wasted searching for things, this would be a lifesaver! I’d use the Avery Wall Manager products to organize the stuff around my computer. This would be great for keeping my computer room organized. I would use it by my desk to keep it clear of paperwork and pens and pencils and mail. We love to craft whether it’s knitting, quilting, cooking, or papercrafts and we love sharing those crafts with each other. Visit our About page to learn all about us.